George T. Sakato, Medal of Honor recipient and World War II veteran, died Wednesday, Dec. 2, in Denver, Colorado, according to the Medal of Honor Society. He was 94. Sakato was born in Colton, California, in 1921 and grew up outside of San Bernardino in Southern California. His family moved to Arizona following the attack on Pearl Harbor to avoid internment on the West Coast. In 1944, he volunteered for the U.S. Army, joining the all-Japanese-American 442nd Regimental Combat Team. According to his Medal of Honor citation, Sakato was a private and fought on the Western Front, earning his Medal of Honor for action in Biffontaine, France, on Oct. 29, 1944. After he and his unit had pushed enemy German combatants off of defensive positions, he charged the counter attack after his squad leader was killed. "Taking charge of the squad, he continued his relentless tactics, using an enemy rifle and P-38 pistol to stop an organized enemy attack," reads the citation. "During this entire action, he killed 12 and wounded two, personally captured four and assisted his platoon in taking 34 prisoners. By continuously ignoring enemy fire, and by his gallant courage and fighting spirit, he turned impending defeat into victory and helped his platoon complete its mission." "I was going to get the guys that shot [my friend] or die trying," Sakato told NBC News in 2011. He originally received a Distinguished Service Cross for his actions, but his award was upgraded in June 2000 following a 1996 study that found that Asian-American soldiers were discriminated against in the awarding of medals during World War II. In 2011, Sakato and six other Nisei veterans were awarded the Congressional Gold Medal. 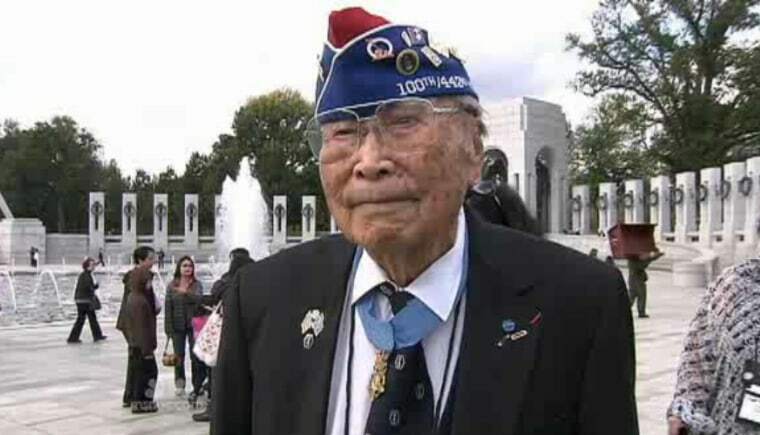 Sakato traveled to D.C. from Denver for the ceremony at the age of 90 — wearing his Medal of Honor, he told NBC News, "for those that didn't come home." Sakato was also a 27-year veteran of the U.S. Postal Service, whose picture was included on the stamp sheet for the World War II Medal of Honor Prestige Folio in 2013. Charles Lam is an editor at NBCNews.com.